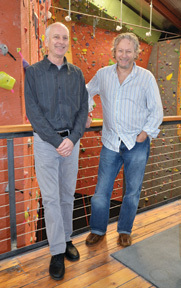 We opened the very first rock climbing gym in America in 1987 on Elliott Ave in Seattle. The gym was no more than rocks glued to painted plywood panels. Today, with more advanced facilities, Vertical World accommodates a variety of offerings beyond just programs to learn how to rock climb, but performance and educational programs in fitness, yoga, and custom group events including birthday parties, school or church groups, corporate events, private parties, and youth camps. Vertical World currently has two other gyms in Washington: Seattle and Redmond. Please contact your local gym to check out the facilities, classes, programs, events or to book a party or corporate event.